One of our most popular series of posts has been “Containers You Never Thought Of”. So we decided it was time to update this post with even more new, unique garden containers for you. And we found some amazing creative planter ideas! Some of these photos we found on Pinterest, and search as we might, could not find a good source for them. They are so inspirational we couldn’t leave them out! (If you know whose work these belong to, please drop us an email so we can give them proper credit!) So here it is, MORE unique garden containers you never thought of! 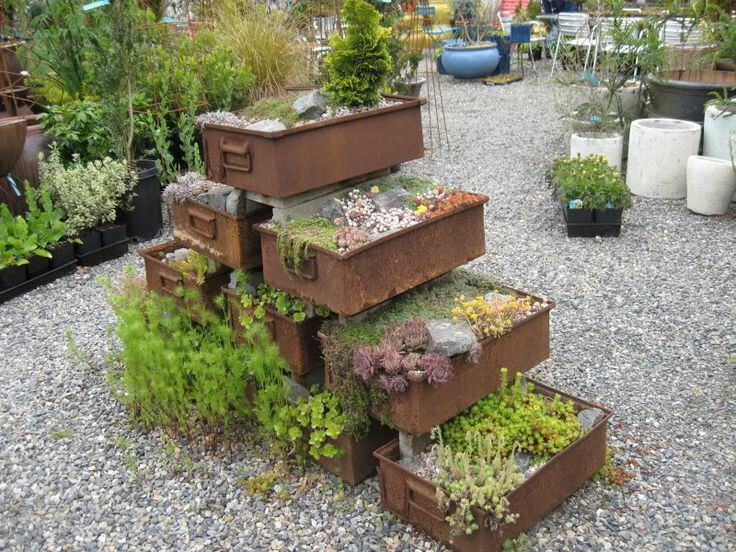 These old metal drawers make quite the unusual garden container. These may be old drawers from a metal desk, or possibly old metal artillery boxes? It looks to us like the first layer of boxes was filled with soil, then concrete blocks were placed along the inner edges of the boxes to create a surface to place the next layer of boxes. Drill holes in the bottom of a container like this, not only for the health of the plants, but also to keep the weight of the arrangement from toppling itself. This photo has an unknown source. Please let us know if you know where it’s from! 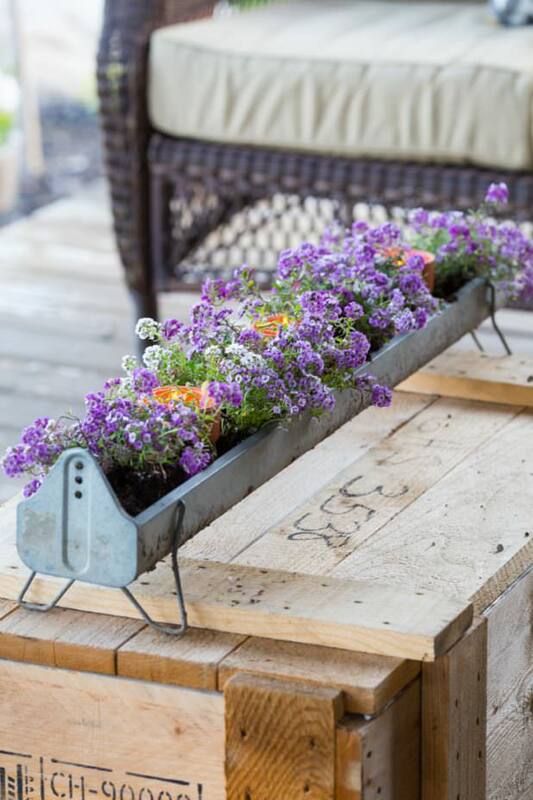 This up-cycled drawer planter from ‘Beyond The Picket Fence‘ is such a charming project. 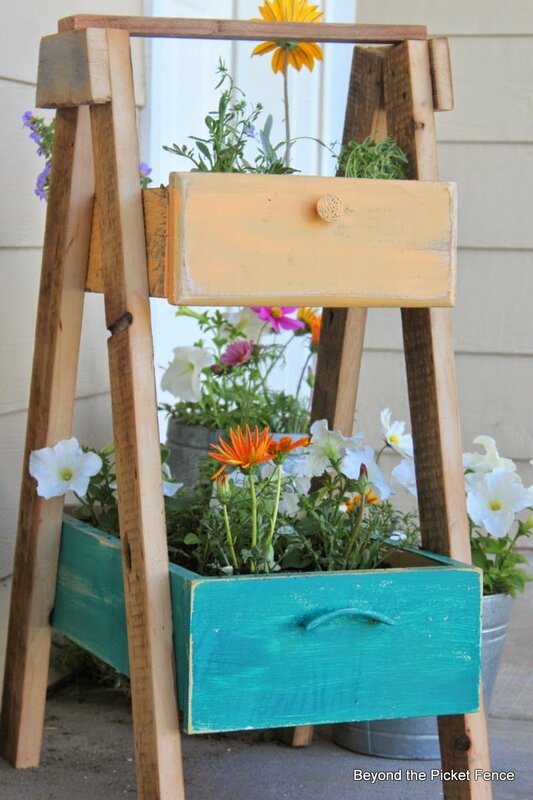 A little scrap wood and some old thrift store drawers is all you need to make your porch the most idyllic on the block! The tutorial for this project has lots of photos and easy to follow instructions. 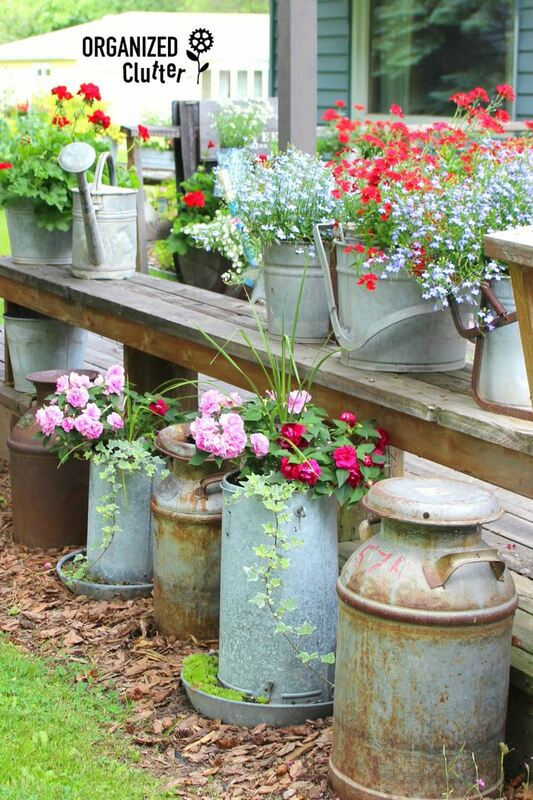 If you love up-cycled junk and farmhouse style, then you will love the junk home garden tour from ‘Organized Clutter‘! 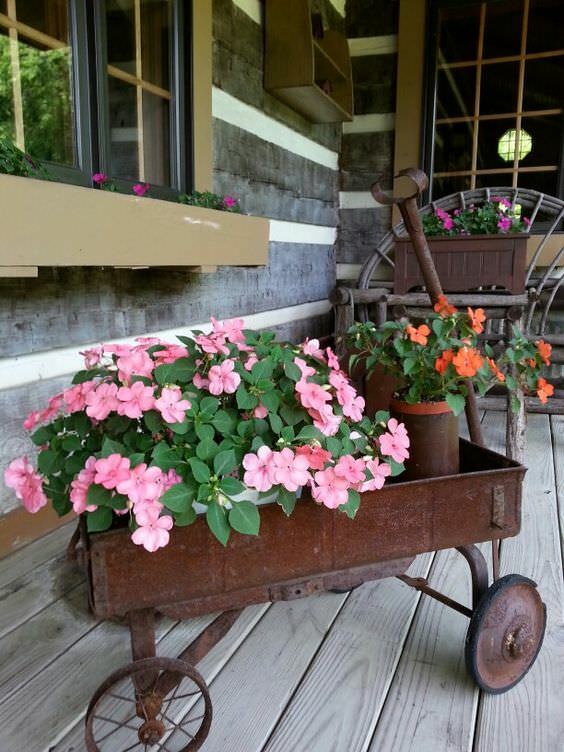 Visit her page and see lots of ideas to recycle metal containers into planters, and so much more! Our favs? The bicycle planter and the banana tree! 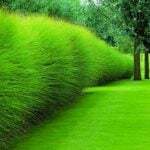 And her gardens… amazing! 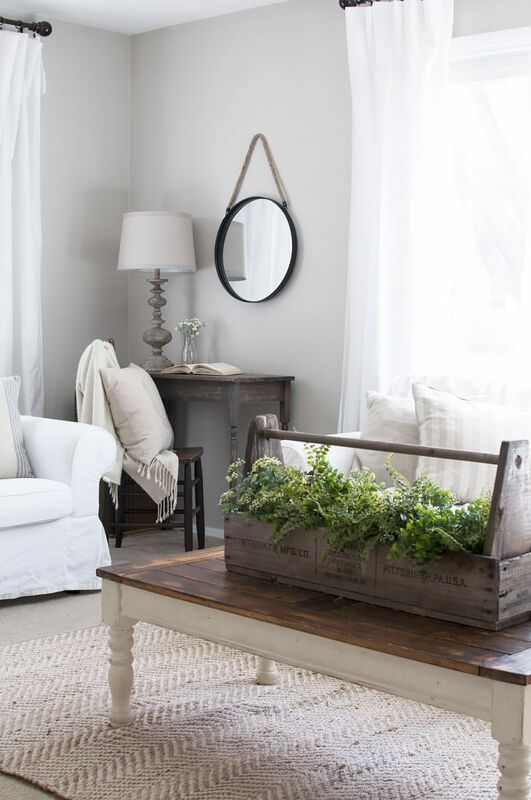 We love Ashley at ‘Cherished Bliss‘, and on her spring home tour, she has this amazing vintage tool box planter. Not only is this gorgeous used inside, it would be easy to grab this and take outdoors. 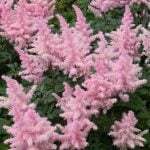 You could brighten up your patio for an afternoon tea party, or simply allow the plants to get a little sun bathing in. This chicken feeder planter from ‘Creative Cain Cabin‘ is an easy DIY. But remember, if you don’t have access to a vintage piece, you can fake it! You can buy galvanized chicken feeders at any farm & ranch supply store. Don’t worry, Mother Nature will make it look “vintage” soon enough! 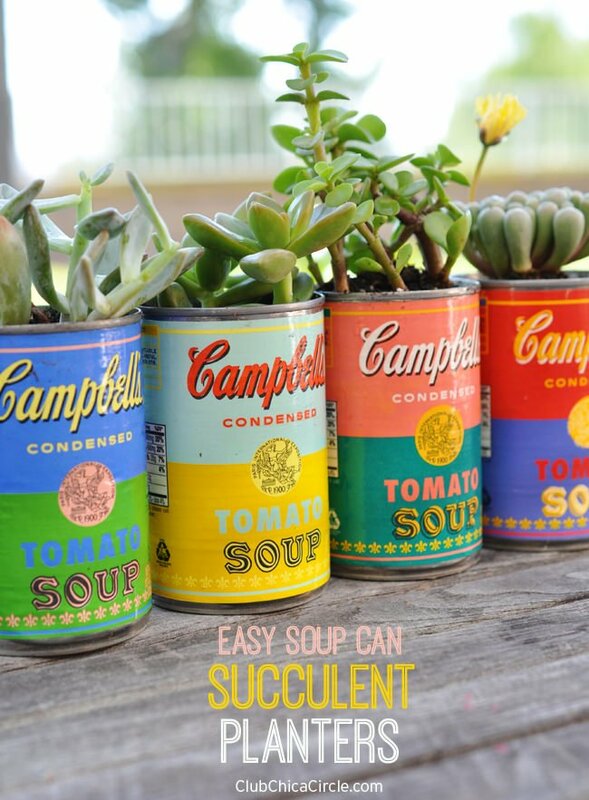 ‘Chica Circle‘ has a tutorial for her vintage soup can garden containers, and it has a secret. While the cans aren’t really vintage (reproductions from Target, real soup cans!) she seals them with a product from the craft store to make them water resistant for planting. Go check out her post to see what it is that she used! 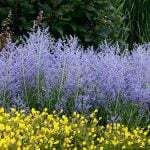 The next three garden container ideas are from ‘BHG‘. 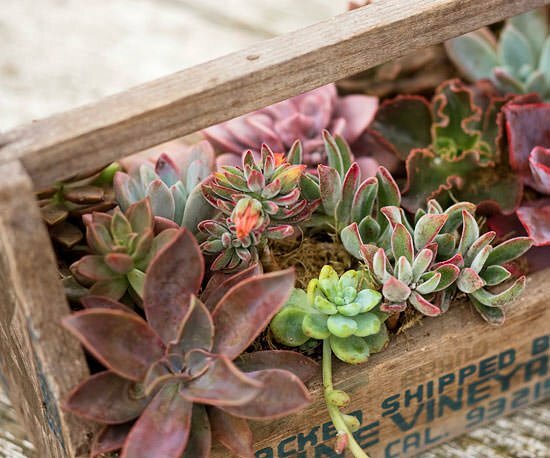 This vintage fruit picking crate makes a perfect portable container garden for these gorgeous sedums. Remember, you can line a vintage piece with plastic to protect it when using it as a planter. 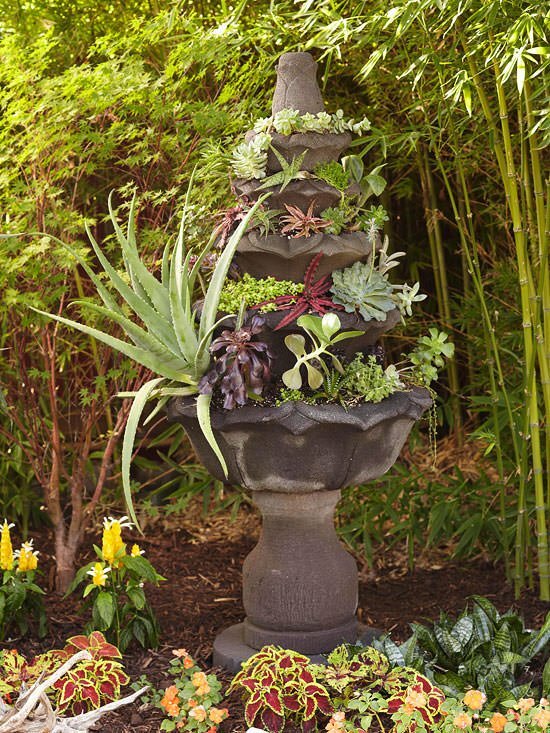 Have an old fountain that is cracked or beyond repair? Turn it into a unique garden container with this easy idea! This type of container garden looks best tucked in among other plants, as if it has stood there for decades. Tiny succulents line the bottom of a repurposed vintage chicken feeder, while larger plants are tucked into the top. No worries about drainage with a project like this one! The handle on this piece make it particularly versatile in the garden, as it is easy to move to a new spot when needed. 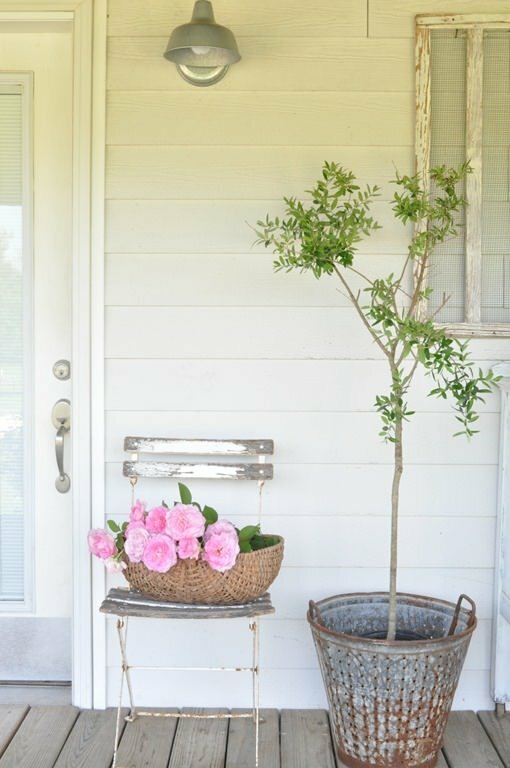 An old oyster bucket from ‘Beckys Farmhouse‘ is the perfect unusual planter for her olive tree on the front porch. If you use a metal garden container, consider putting a plastic pot inside it before planting. The metal can get very warm in the summer, literally cooking the plants roots in the sun. Who doesn’t love an antique child’s wagon? Set plastic pots full of your favorite plants into a piece like this, and make it an instant planter. If yours is a true antique that you would like to make last, then use a plastic liner in the bottom of the wagon to protect it from long exposure to water. Photo found on Pinterest, with no known source. Here are some unique garden containers from ‘BlackGold‘. 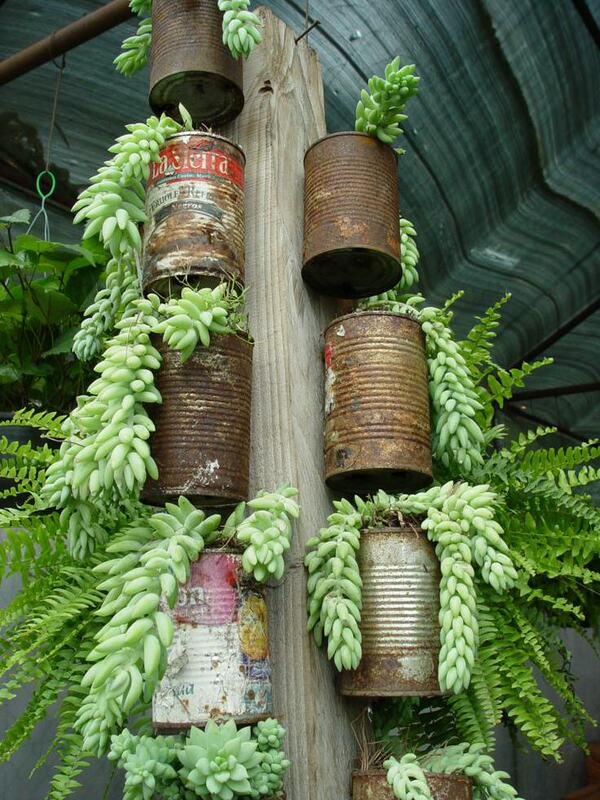 These rusted tin can containers are a reminder of how anything can be made to look beautiful! I love the color and texture this Burros Tail adds to the planter, great contrast! Finally, this excellent idea was from a blog that no longer exists…This is a playful and fun garden container that will make adults and kids smile. I can’t say it enough, drill those drainage holes! Hope you enjoyed all these new additions to our post on unique garden containers and ideas. We have even more on Part 2. Don’t stop here, jump on over and visit those ideas too! loved the ideas!!! now to scramble for some containers!! I like them all, but what is the plant inside the tyre? That looks like Ice Plant, or Delosperma to us! At the risk of being accused as “spewing” I’m going to take the advice “Speak Your Mind” and just say—any “rusty metal” is a serous health hazard, unless you are certain you and anyone who comes near it is current on their tetanus vaccine. I love your garden recycling art, but never rusty metal. I have never met anyone with tetanus. Does it still even exist? I love rust & patina. Live a little. You go! Remember, do it with purpose, and it is art! 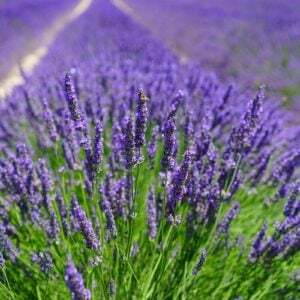 Rosemary, sorry for your loss. I filled an old pair of Grampas work boots with garden soil many years ago and put a few hens and chicks in them. Now you actually can’t even tell that there are boots under them any more because they have taken over the boots. I would suggest keeping the hens and chicks in check so that you can still see your sons boots. Great ideas. My son passed away last year and I can’t seem to get rid of his work boots, I should say, I don’t want to get rid of his old worn work boots. Thanks to this article about using unusual items to plant in I now know how I will keep him around me just a little longer. Thank you for the idea. Next year I will plant into his scuffed up up hard hat and welding helmet. The ideas just go on and on and on. My heart goes out to you! What a wonderful way to have memory and sharing it with others! We, too, lost a 32 year old son last Thanksgiving, so my heart aligns with yours. He had just bought new work boots for wearing to grad school in the NYC winter. They are on my dining room mantle so our puppy won’t chew them any more…but had been at the door ever since he took them off that day. I’m a landscape designer and have been thinking of bronzing them like his baby shoes and using them as planters near his memorial magnolia. With thoughts of you, too, I will now do that. Since they were new, and worn for only 6 days, I’d like to protect them. Shellac? Any ideas? We live in Massachusetts. Thanks for all the wonderful sharing. what paint do you use on the tyre please – and do you need drainage holes?? I saw this on pinterest last year and I used an “all types” glossy spray paint. I could not get my drill to make the drainage holes, so i keep the flowers in their small pots (with holes) and they kind of stay invisible, if they are small enough to tuck in. It’s very dry here, so it seems like we can never over-water. Love the inspiration of your post!!! I think recycling is an art.. Great ideas indeed..
Love, love these ideas! 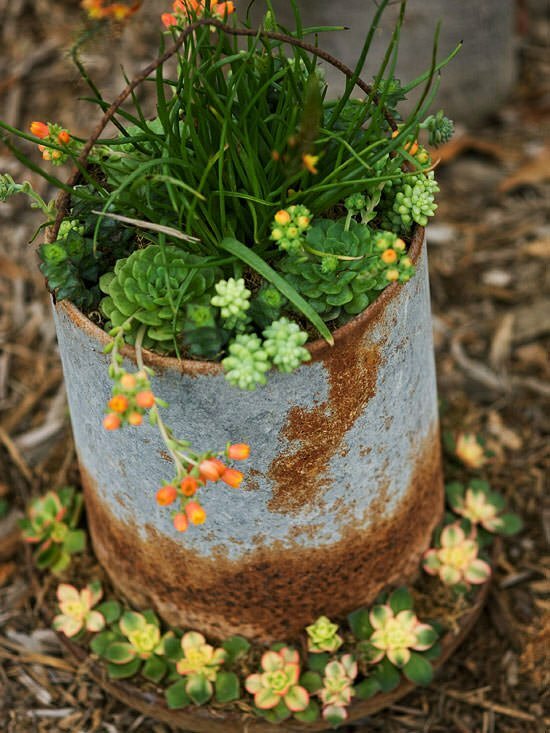 Reusing, recycling and anything rusty is awesome! We already have a clawfoot bathtub and cowboy style work boots we used for our wedding (ice in the tub for drinks and boots for flowers) that I plan to repurpose for the yard. We are thinking recirculating water through an old rusty pump at the head of the tub and placing plants on one of those bathtub racks you use to hold your book, soap, etc. I reuse rusty junk in sculptures and hanging things all the time. I wonder, though, if they should be lined with plastic like they do to metal baskets in nurseries to prevent MORE rust (& disintegration), and dripping. AND, if so, do we make holes in it to prevent molding roots? Maybe some pebbles in the bottom to allow SOME drainage root relief? What do we think of this? When I adhere rusty parts, I either wire things together, or I sand the two areas to be joined and use a two part epoxy putty. It’s strong and sets up in 3 minutes. Some people call it plumbers putty and one is made by JB Weld. What do we think? I, too, love to repurpose. I have my father’s tackle box. He has been gone close to 20 years and it was old when he had it. It is a bit useless for tackle but I love it because it was his. I have a new covered back deck that I plan on using the tackle box for plants this year. Thanks for all the great ideas. I think all of the posts were inspiring and I know it’s been a year since xxxxxx spewed her stuck up comment on your lovely blog, my New Years wish for her is that she was able to look back at your blog and see the beauty in all things old & new and not just in what her gardners plant in her yard year after year as she leads us all to believe happens. I think you either appreciate something like this for what it is, and if it’s not your thing, no need to express that to someone just sharing ideas. Beauty is in the eye of the beholder, I love all of these ideas in the right setting. I love anything old and rusty I can plant in. We went through our family farm that was falling apart and scrounged and founded several old metal containers. They were extra special with the memories of grandparents using them. Some got spray painted, some we just planted in. 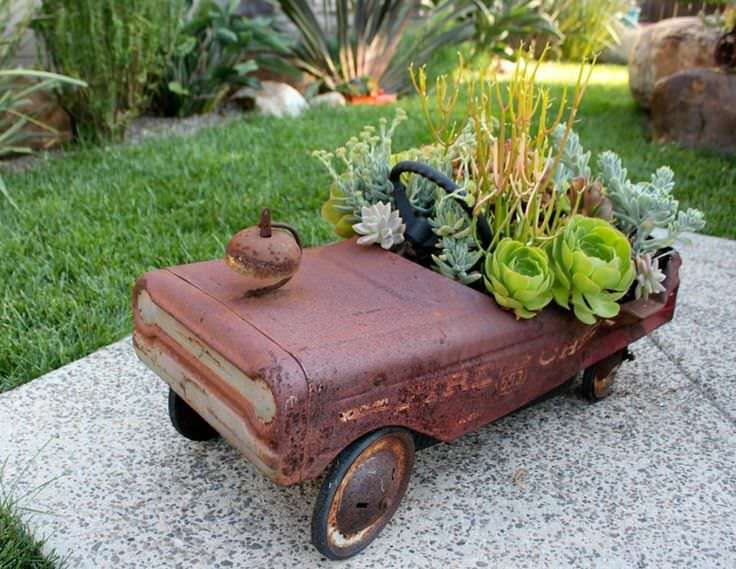 I have a vintage truck planted with succulents, several chicken feeders and old milk crates. One of those tool boxes (the green one) is actually from our website…love seeing how these ideas keep going all around the web. We love the “shabby” at Potted. Wow, thanks for sharing that Annette! I hope our readers will visit you at The Potted Store online! We had “steps to nowhere” the door was closed up years ago. I set old cement blocks and planted succulents. They spread and climb and easier then removing cement steps. Like this idea as well! I repurposed an old, broken wooden chair I found the barn of the house we recently purchased. I afixed several planters of different colors and sizes to the arms, a small one hangs from the back, and knocked out some seat slats to place a few containers there. 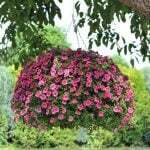 Add petunias and creeping flox and it’s lovely! I did a dining room chair I found by a dumpster. Removed the cushioning and made a big hole in the seat board. Put in some saggy used window screen and an old dish towel. Filled it with soil and flowers. Loved that chair. As to the constant reminders to drill drainage holes . . . yep. Didn’t drill holes in the toilet bowl and tank. Flowers didn’t live. Thought it would go well with the bathtub I had. I have a toilet bowl and my hubby removed plugs that were in the tank and the seal was removed on the bowl. I plant preannuals, then after a couple I get new preannuals and transplant. Wonderful addition to my garden! This yr I think I’m going to plant hen chicks and some other succulents that will survive Michigan winters. I have a potty and why would you need to drill holes when they are there anyway? The potty drains somewhere! I love my 1958 lime green potty. I just don’t overwater, plus I live in NM where it is hard to overwater! I loved all the repurposed containers! My biggest coups are the found objects I can use as containers. I have a collection of antique restaurant colanders that I am planning on hanging on my Side fence and put succulents in. Every project in this article are beautiful. I get old water cans that my son has found and spray paint them,according to the mood I am in at the time, and then plant in them. They are gorgeous and gives me satisfaction that at one time some wonderful, hardworking man used these while going about their duties. Thank you so much!! I spray inside of my “rusty, shabby, repurposed” containers with clear Flex Seal to help them last longer without changing the charming look. Great tip Shawna, do you get Flexseal at home improvement stores? This sounds like a great solution. Do you think it would be okay if you are planting edibles (herbs, strawberries)? I have one of those vintage pedal cars and I haven’t planted it because I thought it would rust too quickly to justify sacrificing it. But if I could spray it with the Flex seal to get a few more years out if it that would be worth it. Thanks for the tip and all the great ideas. I totally disagree with Terri, If anything the “shabbiness” can elevate the beauty of the plants. I love to “repurpose” items that can no longer be used as originally intended. They make beautiful, fun and whimsical additions to my yard and have received many compliments on them. Felt that the shabbiness of the containers overwhelmed the plants. Perhaps not quite as sloppy and a little more refined. I think “shabby” is a term that is pretty objective and repurposed containers are not for everyone! Thx for your feedback! I think they look awesome! Some people are a little rude. 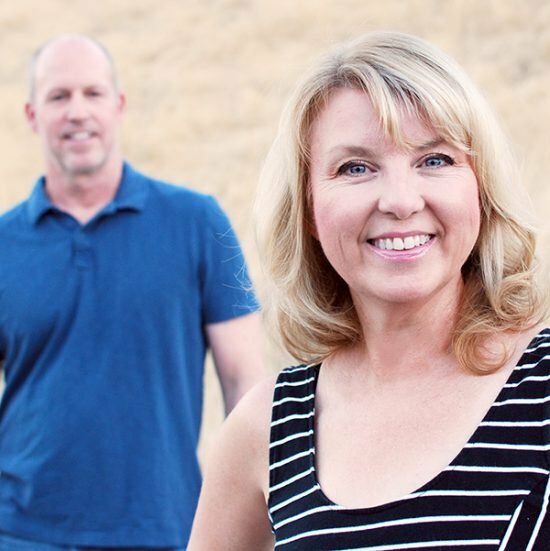 Kathy just want to thank you for both your refined and courteous response as well as your interesting ideas! Wow, Terri. Super rude comment. In fact, the snottiness of your tone overwhelmes the message. Perhaps not quite as condescending and a little more refined. Love the rocks. I tried making the one with the rock slabs standing on their side and they kept falling over. How did you get them to stay. Probably have to glue them one by one a littleat a time to get them to stick. You wire them together, that’s how the Japanese do it. I think that it is rude and quite frankly I like the containers myself. I love reusing things and i think it adds charater and style with a persons own style. what a rude thing to say. Why bother commenting at all? I loved several things and it gave me ideas of things I have that I can use! thank you!